We had a very interesting talk on November 15th from Richard Brunning about the recent excavations at Beckery, the site of a medieval Chapel. He started by explaining that Beckery would have been an island of hard geology sticking out of the flood plain. Today it is a rather curious landscape, with an industrial park at one edge, and a sewage farm at the other, but the centre line of the chapel lines up with Glastonbury Tor. Speaking about the derivation of “Beckery”, Richard suggested that it might have meant either ‘bee-keeper’s island’ in Old English or is Irish for ‘Little Ireland’. There are numerous legendary stories linked with Beckery. 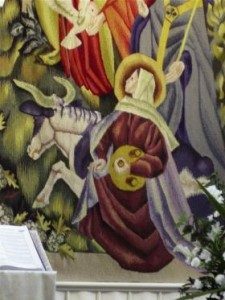 Medieval writers told of a visit to Beckery by St Brigit who visited the island in 488 AD and is said to have left behind some items including a necklace, small bell, a bag and some weaving implements. These relics were displayed in the medieval chapel named after her for pilgrims to view. King Arthur was also said to have visited the site and allegedly saw an image of the Virgin Mary. 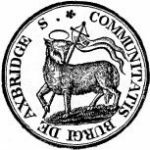 Although the former is possible, Richard suggested, that the latter was probably something made up by Glastonbury Abbey for publicity and financial reasons. The site was first excavated by John Morland in 1887-1888. This found the remains of two chapels, a smaller Saxon timber chapel built around 700 AD and a larger Norman chapel which replaced the former and which was built around 1000 AD and enlarged in 1290. They also found the walls of what was thought to be a priest’s house and 6 graves with human remains. The location of the bodies seemed to confirm that the chapel had indeed been built in two phases. The site was re-examined in 1997-8 by Philip Rahtz. 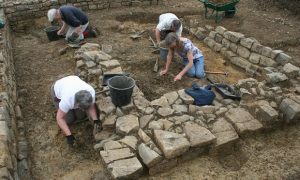 This excavation uncovered further evidence of buildings on the site, which confirmed that a later chapel had indeed been built around the earlier chapel. They also found an extensive cemetery of 63 bodies. One grave was lined with slabs and there were post holes nearby indicating that it was of some significance and it appeared that the first timber chapel had been built around this. They also found some human remains below the foundations of the Chapel indicating an earlier site. Almost all of the bodies were of adult males, leaving little doubt that this was a monastic graveyard. The only exceptions were two juveniles who may have been novices and a woman who may have been a patron or a visiting nun. In those days radiocarbon dating was in its infancy and the results showed that the bones were dated between 600-1000 AD. This led Rahtz to conclude that this was a site of a late Saxon monastery. The conclusion was that wooden building had been replaced in the C11th by another Chapel, which was then re-built in 1291 with a Priest’s house. In 2004-6 a resistivity survey by Beth Francis revealed the presence of a third building and geophysics revealed the possibility of an enclosing ditch. The recent excavations at Beckery sought to extend the dig beyond that undergone by Rahtz and it confirmed the presence of a third building and found evidence for a fourth. It also showed that there was a wall that went far beyond the chapels that Rahtz had identified. Richard suggested that the stone from this wall could have been taken and re-used elsewhere after the dissolution of the monasteries. The first trench was dug over the site of the enclosing ditch in which Iron Age pottery was found as well as a variety of animal bones which have been dated c.1020 AD -1155 AD. The main aim of the excavation was to date the site more accurately. Although the skeletons found by Rahtz have been lost there were some remaining under the Chapel walls and the new excavation uncovered human remains on 5 sites. 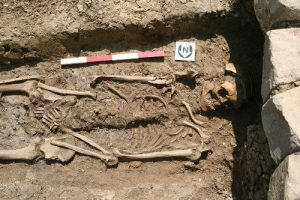 Seven individuals were dated from three largely complete burials, two partial burials that had been badly damaged by the foundation trench for one of the medieval chapels, one person represented by a single extra leg bone in one of the complete graves and a jaw fragment from the 1960’s backfill. One was of a male of about 167cm, which showed a fracture in one arm and teeth which were very worn but which showed few cavities. Isotope analysis suggests that they had a meat rich diet although the last individual dated had clearly had a more vegetarian diet and showed similarities with bones found at Glastonbury Lake Village. © south west heritage trust: Excavation of adult male over 45 years old. Radiocarbon dating found that the earliest bones were from between 406 AD and 544 AD, which predates the conquest of Somerset by the Saxon kings of Wessex in the 7th Century. Later bones found were dated from about 618 AD – 710 AD and suggest that the monastic use of the site may have ended in the later 9th century when Somerset was attacked by Viking armies. These dates provide the earliest archaeological evidence for monasticism in the British Isles. 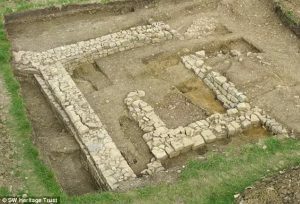 There were earlier sites in France but these findings show that this may have been the earliest monastic site in the UK and pre-dates Glastonbury Abbey. Richard suggested that the ancient origins of the Beckery site may explain why later medieval writers linked it to figures such as King Arthur and Saint Brigit. There were many interesting pottery finds in the site. There was a lot of Saxo-Norman pottery circa 950 AD -1150 AD, Iron age pottery and lots of animal bones dating from C12th – C16th some of which were found in a new building identified on the site which may have been used for stabling. Further isotope analysis is planned in order to try to determine if the monks were from the local population or if they had come from further away. In conclusion Richard said that the monastery could have been there when St Brigit visited the area. Imported medieval pottery found there suggest that it was of high status and Richard suggested that this might mean that the the monastery had a secular power base before the Anglo-Saxon conquest of Wessex which might have led to its destruction and its replacement by a Chapel. More work needs to be done but the findings are very significant for the history of the area.